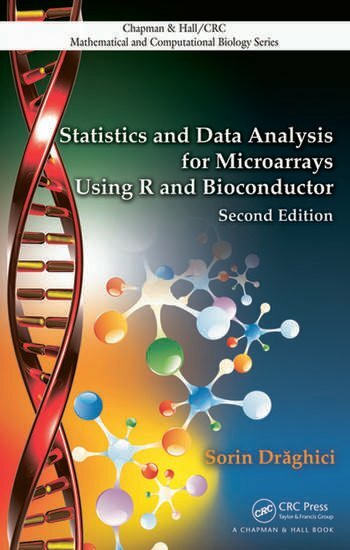 Richly illustrated in color, Statistics and Data Analysis for Microarrays Using R and Bioconductor, Second Edition provides a clear and rigorous description of powerful analysis techniques and algorithms for mining and interpreting biological information. Omitting tedious details, heavy formalisms, and cryptic notations, the text takes a hands-on, example-based approach that teaches students the basics of R and microarray technology as well as how to choose and apply the proper data analysis tool to specific problems. Completely updated and double the size of its predecessor, this timely second edition replaces the commercial software with the open source R and Bioconductor environments. Fourteen new chapters cover such topics as the basic mechanisms of the cell, reliability and reproducibility issues in DNA microarrays, basic statistics and linear models in R, experiment design, multiple comparisons, quality control, data pre-processing and normalization, Gene Ontology analysis, pathway analysis, and machine learning techniques. Methods are illustrated with toy examples and real data and the R code for all routines is available on an accompanying CD-ROM. With all the necessary prerequisites included, this best-selling book guides students from very basic notions to advanced analysis techniques in R and Bioconductor. The first half of the text presents an overview of microarrays and the statistical elements that form the building blocks of any data analysis. The second half introduces the techniques most commonly used in the analysis of microarray data. What Is Expected from Microarrays? "I Do Not Believe God Does Not Exist"
What Is the Gene Ontology (GO)? A Summary appears at the end of each chapter. Sorin Draghici the Robert J. Sokol MD Endowed Chair in Systems Biology in the Department of Obstetrics and Gynecology, professor in the Department of Clinical and Translational Science and Department of Computer Science, and head of the Intelligent Systems and Bioinformatics Laboratory at Wayne State University. He is also the chief of the Bioinformatics and Data Analysis Section in the Perinatology Research Branch of the National Institute for Child Health and Development. A senior member of IEEE, Dr. Draghici is an editor of IEEE/ACM Transactions on Computational Biology and Bioinformatics, Journal of Biomedicine and Biotechnology, and International Journal of Functional Informatics and Personalized Medicine. He earned a Ph.D. in computer science from the University of St. Andrews. The book by Draghici is an excellent choice to be used as a textbook for a graduate-level bioinformatics course. This well-written book with two accompanying CD-ROMs will create much-needed enthusiasm among statisticians. I really like Draghici's book. As the author explains in the Preface, the book is intended to serve both the statistician who knows very little about DNA microarrays and the biologist who has no expertise in data analysis. The author lays out a study plan for the statistician that excludes 5 of the 17 chapters (4-8). These chapters present the basics of statistical distributions, estimation, hypothesis testing, ANOVA, and experimental design. What that leaves for the statistician is the three-chapter primer on microarrays and image processing, plus all of the data analysis tools specific to the microarray situation. … it includes two CDs with trial versions of several specialised software packages. Anyone who uses microarray data should certainly own a copy.